Anyhooo, I’ve been reading a ton of books and following the advice of my Jamaican born agri-tutor (is there anything sexier than a man who can till soil? I think not!) I’ve even got my little man-child saying a nightly prayer for our strawberry plants. This year I’m going to be the one blowing up your Facebook feed with dozens of tomato/cucumber/pepper/lettuce/summer squash pics, dammit!! Yeah I’m serious about my veggies. Apparently I’m not the only one. It seems the FLOTUS is super excited about her “little vegetable garden” at the White House. So much so, she wrote a book about it. 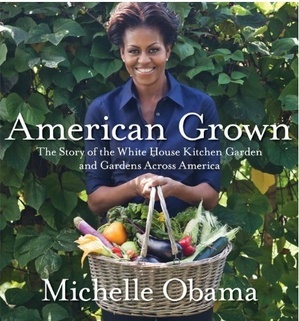 American Grown: The Story of the White House Kitchen Garden and Gardens Across America features stories and pictures from the White House kitchen garden as well as other community gardens around the country. Ladies listen here, gardening is where it’s at! And here’s the thing, even if you don’t have space in your yard for a big garden, you can still get in on the fun. Just go to the store pick up a few pots, a bag of soil and a collection small herb plants (mint, basil, dill, etc) and find a sunny place in your kitchen to rest them. In a few months you’ll have a bunch of tasty stuff to add to your favorite summer dishes. You can also use your (container) garden as an opportunity to teach your children about the power of food. We already know that the food industrial complex isn’t nearly as concerned about the health and wellbeing of your children as you should be, otherwise they woudn’t be spraying our fruits and veggies with cancer causing poisons. It’s time to take back our food. So, grab some gloves, get on your knees and GET TO DIGGING! FAB Girls know we can change the world, one seed at a time.